Disc I: Pegasus; Prometheus Unbound; Lotus; The Three Marias. Disc II: The Three Marias; Lost and Orbits Medley. Disc III: Lotus; She Moves through the Fair; Adventures Aboard the Golden Mean; Prometheus Unbound. There are many Wayne Shorters, all different: there is the composer and hard-edged player with Art Blakey producing beautiful tunes like ‘Lester Left Town’ battling mightily with the ferocity of his front-line partner Lee Morgan. Taking over the Miles Davis Quintet of the mid-sixties, out playing Davis and composing pieces such as ‘Footprint’ and ‘Orbits’. There is the submerged player in Weather Report occasionally surfacing to play a solo on ‘Thanks for the Memory’ reminding a fusion crowd what a great jazz musician could sound like. Running throughout the sixties there is the denizen of the Blue Note Studios composing with his collaborators and conspirators a series of albums that still are not really understood and fully appreciated. Finally, there is the new Wayne who emerged in 2001 with his quartet: older, wiser tentative, elusive and allusive, playing music that is so abstract that it has all the delicacy of a spider’s web and all the subtlety and tensile strength of imperishable music that will grow in importance across years. Now we have ‘Emanon’: nothing like the Gillespie piece of the same name. It is five years since the last release from Shorter. It is a lavish package: 3CDs and a graphic novel. Disc one is taken up with a suite featuring the Orpheus Chamber Orchestra, a 34-piece ensemble, performing music composed and arranged by Shorter. The need for jazz musicians to work with written symphonic music is long established. Charlie Parker with strings, Duke Ellington with symphony orchestra, Ornette Coleman with orchestras. Is it a search, a yearning for the for respectability? Is it because their real artistry is not given the kudos offered to classical music? This suite is interesting. The quartet works in harmony with the orchestra. Is Shorter bringing anything fresh to the work with the orchestra? Not really. Third stream music explored the area in the nineteen fifties and retired hurt. However, when Shorter’s soprano sax soars above the full ensemble, improvising high-spirited responses to the orchestral players, the effect is magical. 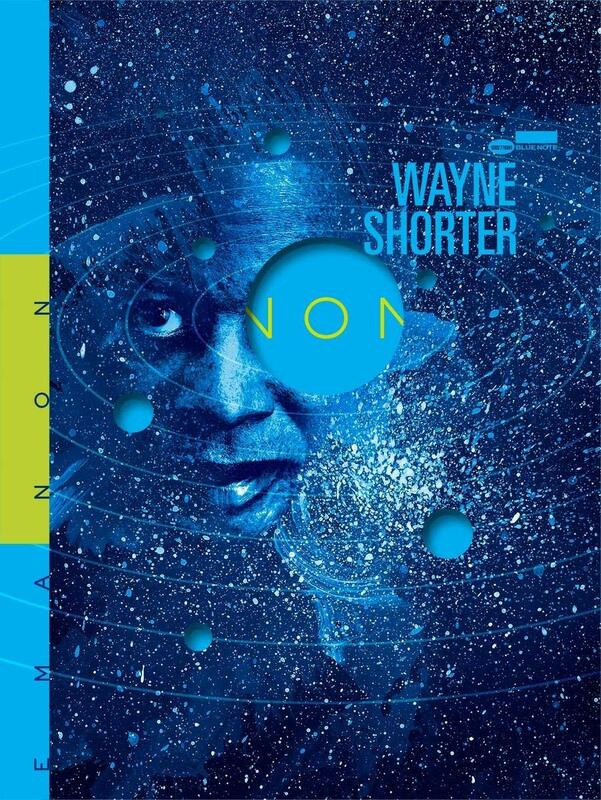 The music throughout is performed by the Wayne Shorter Quartet, a working unit for the better part of two decades, consisting of Shorter on soprano and tenor saxophones, Danilo Pérez on piano, John Patitucci on bass and Brian Blade on drums. The London live recording looks at music from the suite in quartet form, making it an interesting comparison. ‘Three Marias’ ends the first disc and starts the second. In the live quartet version, it is nearly twice as long. Each performance is a new approach. Each of the four movements in the new suite suite — "Pegasus," "Prometheus Unbound," "Lotus" and "The Three Marias" is referenced in the graphic novel written by Shorter with Monica Sly and illustrated by Randy DuBurke. The publication is inspired by the concept of a multiverse and features Emanon, a rogue philosopher hero who may well be Shorter. The dystopian story has some relevance to Shorter’s allegiance to Buddhism. The ‘novel’ the story of Emanon, as he moves to four worlds in the multiverse, dealing with fear and confict. This reviewer is not a fan of graphic novels, he finds it difficult to divorce them from the comics of his youth. He also finds it difficult to reconcile this graphic novel with the subtle ambiguity of Shorter’s music. How right he is! Here are the fluid shifting rhythms, the quirky, risk-taking, playing with melodies; drummer Brian Blade experimenting with rhythm pulling everyone back, pushing them forward. One moment the quartet is ‘out’ and then subtly moving ‘in’, breath-taking changes, moving as one, before fragmenting into their own worlds. This is collectivist spontaneity, the opposite of the star soloist with rhythm. Is it a search, a yearning for respectability? Is it because their real artistry is not given the kudos offered to classical music? This suite is interesting. The quartet works in harmony with the orchestra. Is Shorter bringing anything fresh to the work with the orchestra? Not really. Third stream music explored the area in the nineteen fifties and retired hurt. However, when Shorter’s soprano sax soars above the full ensemble, improvising high-spirited responses to the orchestral players, the effect is strangely moving. The whole package is a startling, thought out production, completely unlike anything else in jazz. It demands attention and will reward reflection. Emanon is a physical-only release that will be available in two versions; a Standard Edition that packages 3x CDs with the graphic novel, and a Deluxe Edition that packages 3x 180g vinyl LPs and 3x CDs with the graphic novel enclosed in a hardcover slipcase.